So this post is by no means original but I thought I’d join in anyway. Today I thought I’d talk about all the products I’ve used up recently and if I’ve enjoyed using them or would I buy them again. I’ll crack on because there’s quite a few to get through. This conditioner is amazing, I use it alongside the matching shampoo but that just hasn’t run out yet. It has a gorgeous fresh orangey scent which is great if you are a morning shower person, despite this conditioner only being for normal hair as apposed to dry it still works really well with my long hair and always leaves it feeling clean and nourished. Would I repurchase? 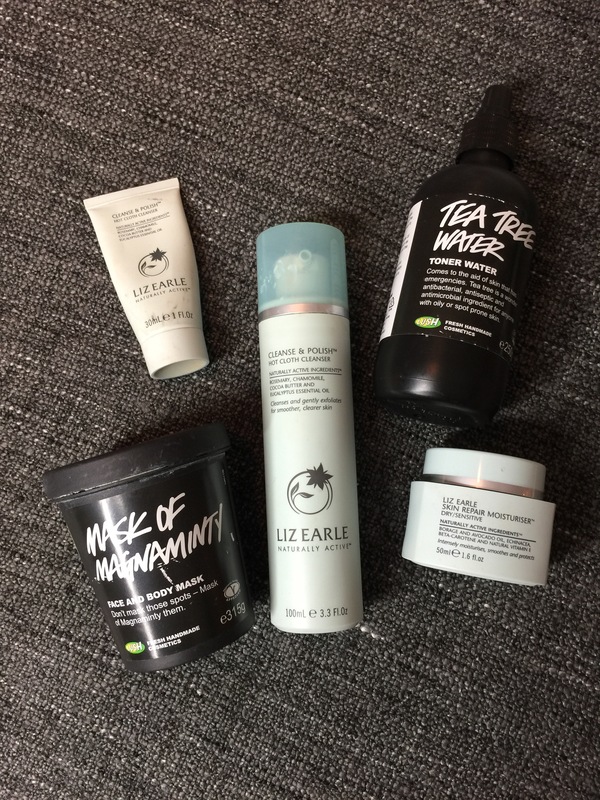 I received this conditioner as a free gift with purchase from the Liz Earle Counter a while ago (they often run a promotion where you receive a free full size body wash, shampoo and conditioner when spending £50 or more). I am currently using up another bottle of this so maybe I will repurchase this one day but I think I’ll try something else new first before returning to this. Not the most interesting of empties but I finished this deodorant off, it has a nice clean scent, lasts all day, is reasonably inexpensive and most importantly doesn’t leave annoying white marks on your clothes (I practically live in all black). Would I repurchase? I already have…everyone needs deodorant. This stuff is really nice, especially if you have an oily skin that is prone to spots, the tea tree in this spritz helps to calm and dry out any blemishes you may have. This toner is also Vegan so if you’re on the look out for Vegan or cruelty-free skincare this stuff is perfect. I like that this product comes in a spray as it also serves well as a nice little refresh on a hot day to cool down. Would I repurchase? In the future probably, as it is really affordable and ethical but at the moment I’m trying to use up products I already own so I’ll have to use up my other toners first. This is my ultimate holy grail beauty product! If I was on a desert island and could only have 1 beauty or skincare item it would be this. I have been using this cleanser for years now and nothing else compares for me. At £15.50 some people think this slightly expensive but I think I can’t put a price on how good this makes my skin feel. This cleanser can be used morning or evening on bare skin or to remove makeup, the muslin cloth gently exfoliates your skin without being too harsh and helps break down even the toughest of eyeliner. Liz Earle is an all natural, cruelty-free brand and their use of essential oils like Eucalyptus in their products really pays off. If I don’t use this whilst I travel or stay at a friends my skin knows about it- it sounds stupid but now my skin doesn’t feel or look its best unless I use this product! Due to the nature of the natural ingredients I do know of a couple of people who have found this product irritates their skin or does not work as well as a more harsh cleanser. If you’re unsure pop down to a counter in Boots and ask one of the members of staff to test a small amount on your face to see how you react so you can be sure before you buy. Would I repurchase? 1000 times yes, I already have new bottles at both mine and my boyfriends. 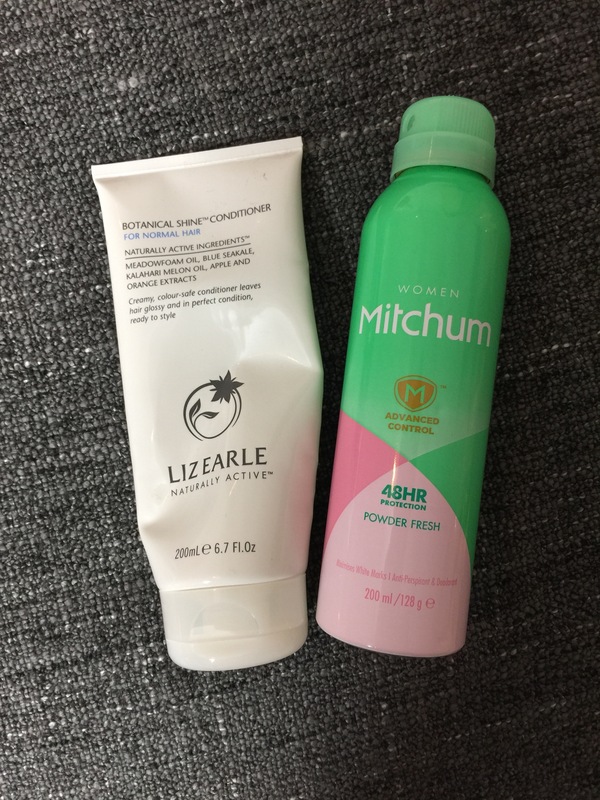 If you only try 1 item in this empties post make it be this- they even sell a set of travel minis to take away on holiday! Yet another Lush product…I can’t help it they’re just so good. This mask is perfect if you’re having a bit of a bad skin day and you just want to draw all the impurities out to get your skin back to normal. Due to the gritty particles in this mask it also works really well as a body exfoliator, which in turn also draws out any nasties in your skin. I’ve also heard it works wonders for the rough skin you can get on the backs of your arms. Top tip- if you have a cold and are feeling sorry for yourself, pamper yourself with this mask and you will miraculously be able to breath- the peppermint in this help to clear your sinuses as well as calm your face. Would I repurchase? I already have and the new pot is self preserving so has an even longer use by date which is great. Also did you know that if you save 5 of the black Lush pots and take them back into store to be recycled you will review a free fresh face mask of your choice, so this pot won’t be thrown away after I’ve finished writing this post. Now I swear I’m not some kind of Liz Earle obsessive, it just seems that all of my products have a pact with each other to run out at the same time and make me look like a madwoman! That being said this is a really good moisturiser, it has the same active ingredients as the cleanser which is why I think it works so well for me as it keeps my skin in a routine and doesn’t bombard it with too many different scents and ingredients. Would I repurchase? In winter this was perfect as the weather dried out my skin so badly but now we’re getting a bit of sun in the UK I think I’m going to try the normal version as I don’t want it to feel too heavy on my skin over summer. Finally onto makeup! This primer is in theory part of the colour correcting range but the pink one is actually intended to make dull skin luminous again rather than to change the tone of your complexion. 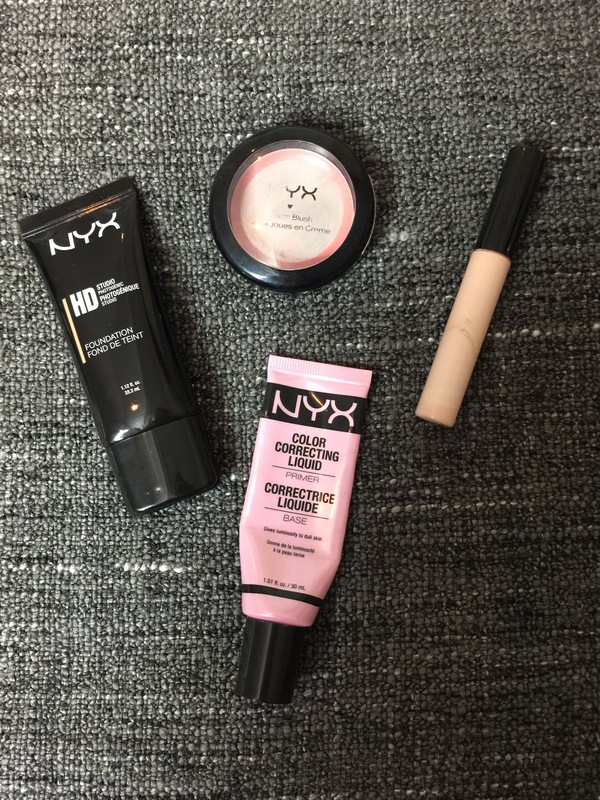 This primer did work really well under my foundation to give me a dewy look (I am not one for a matte face) and was very easy to apply. Would I repurchase? Yes probably in winter when my skin is at its most lifeless as it is so cheap to pick up, but for now I have opted for the yellow version which is intended for fair skin tones. Everyone and their nan talks about this concealer in the Youtube and blogging world and there’s a reason why. This product gives great coverage for the price, it’s so cheap yet it lasts longer and is less cakey than a lot of more expensive concealers I have tried. Would I repurchase? At the moment I’m aiming to use up my Nars and NYX concealers but when the time comes to it, yes I will be buying another one of these. Cream blush’s are one of those things you can either take or leave but I really love them. I think they give a light dewy appearance which is great for winter when your skin is dry and shows up powders, but also in summer and on holiday to achieve a no makeup makeup look. This shade works really well on fair skin and isn’t too much, the formula blends really well with foundation as well as onto bare skin. Would I repurchase? This is my favourite cream blush I’ve tried so far but I want to test out some others first before returning to it. At the moment I’m trying the same blush but in the shade Tea Rose and also a Kiko Cream Blush stick. This is a lovely foundation that gives light to medium coverage which works well for my skin, but if you’re looking for a matte finish full coverage foundation this might not be for you (try the Stay Matte but not Flat Foundation instead). I wore this through all of summer when I was slightly more tanned, be careful when choosing your shade, if you can, go into store to look because I found the numbering does not correlate with the shades. There are in theory 3 shades before the one I chose but they were all too dark for me and as I am ALWAYS the lightest shade I found this quite odd. Would I repurchase? I do have a spare bottle which is unopened but I need to wait until I’m a bit less pale before I can use it so I don’t need to buy this for a while. If you’re still here, well done that was a very, very long ramble but hopefully it was useful to some of you. Have you tried any of these products, if so what did you think? 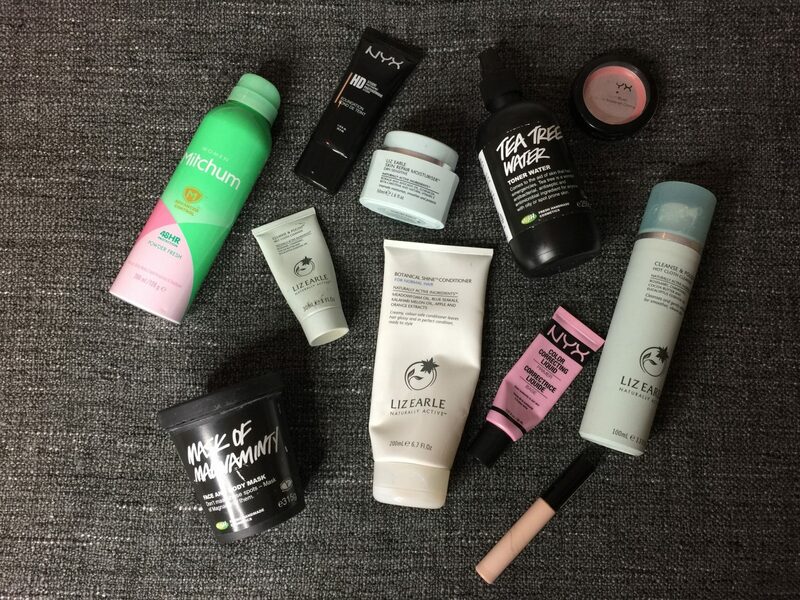 What products have you used up this month?